I’m about to leave home and visit another far-flung part of Australia – Broome in Western Australia - and it has made me look back at my journal from my first visit to the Outback at the end of last year, when I had the chance to visit Broken Hill, an isolated mining city in the far west of New South Wales. It’s over 1100 km (683.5 miles) from Sydney and surrounded by semi-desert, so I was excited by the chance to see for the first time the colours of the outback. It was interesting preparing my palette for the journey. I bought a few new watercolour pencils and topped up with Daniel Smith Transparent Red Oxide, which is a fabulous colour that makes everything better! Broken Hill once produced 1/3 of the world’s silver. 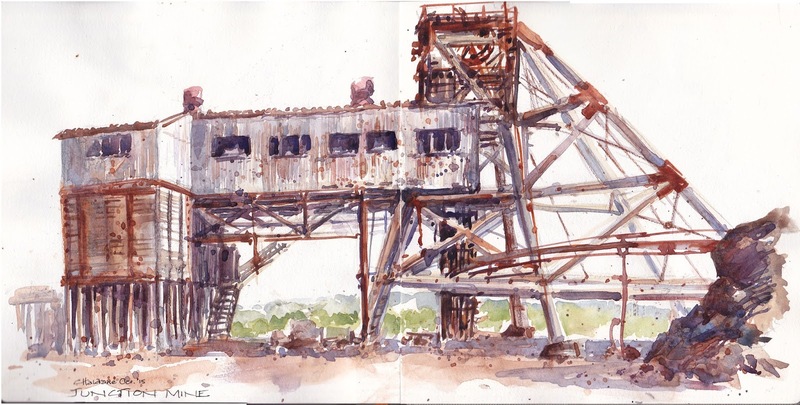 In the early 1900s over 8000 men worked its mines and the remnants of its mining history are everywhere, like the old BHP company poppet head on the Line of Lode that looms over the city. But there is so much more to see than mines. A special experience was to go out to the Living Desert Reserve at sunset to view the stone sculptures. This Aztec sun god with its keyhole seems to be the favourite. It’s a place of utter tranquility, just entrancing as the sun sets and casts a vibrant orange glow, which gradually turns to grey-mauve as it sinks below the horizon. It was one of the most special places I’ve ever painted! And I was glad to have my Schminke transparent orange with me! Another special experience was visiting Kinchega wool sheds about 100 km (62 miles) out of Broken Hill. 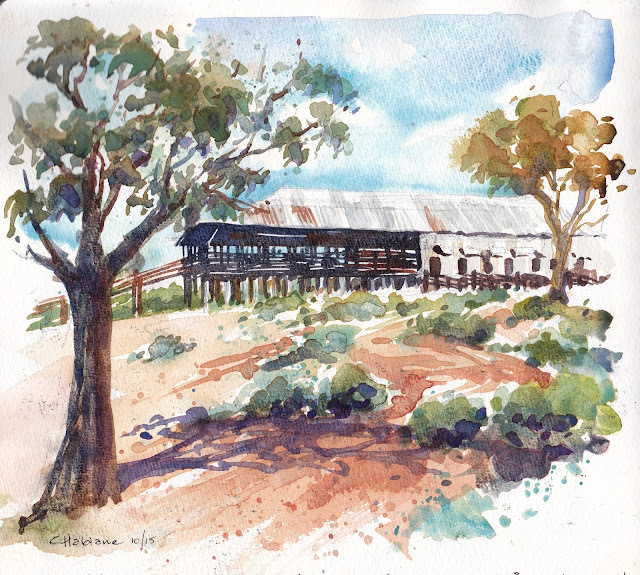 Built in 1875, they’re so remote and a real step back into Australia’s pastoral heritage. In 97 years of operation 6 million sheep were shorn here. If the boards could talk! You can’t help but marvel at the tenacity of those early settlers. How did they survive the remoteness. We were there on a 38°C (100.4°F) day but at least we had an air-conditioned car to travel in! We also stopped where explorers Burke and Wills’ expedition camped on this river bank on their quest to cross Australia from Melbourne in the south to the Gulf of Carpentaria in the north, as the signage on the tree indicates. Water levels are currently very low and Broken Hill is facing another water crisis as Menindee Lakes dry up. The searing heat of the day came through in the parched colours. When full the Menindee Lakes hold more than three times the size of Sydney Harbour, but the locals told us that currently they’re down to 5% capacity. The dead trees in the Lakes are a well known feature. On my last morning I couldn’t resist going to Junction Mine, which I’d spied the day before on the way to Kinchega. I just loved its strong lines and shapes, along with the rust. I drew in the early morning before breakfast because the forecast was for another stinking hot day. 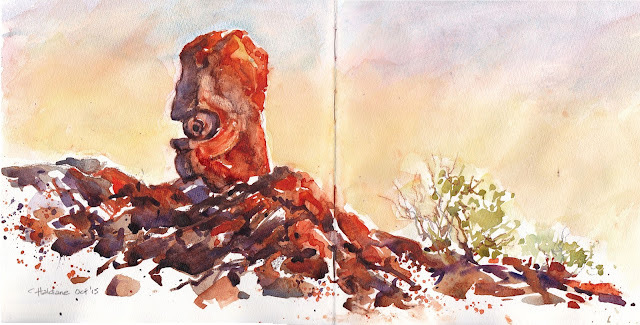 Looking back through my sketchbook I notice how much brown I used on this trip, not generally a favourite of mine, and it was interesting catching the train back on the long journey home, watching the greens gradually appear and the landscape become more lush as we neared the coast. It was a wonderful experience and I look forward to more trips to the outback. It made me feel proud to be an Aussie! 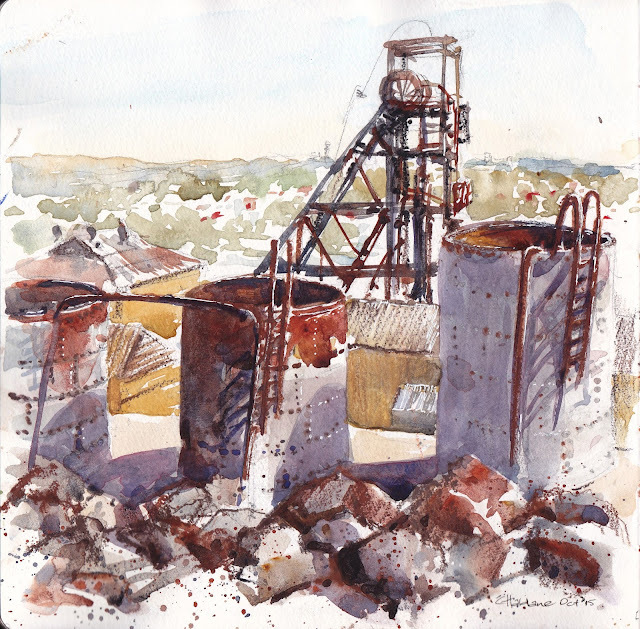 Chris Haldane is an avid member of USK Sydney. You can see more of her work on her Flickr site.